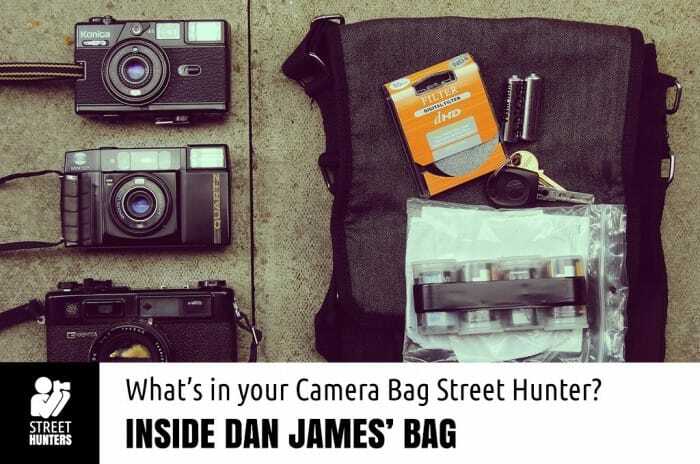 Inside Dan James’ Camera Bag! 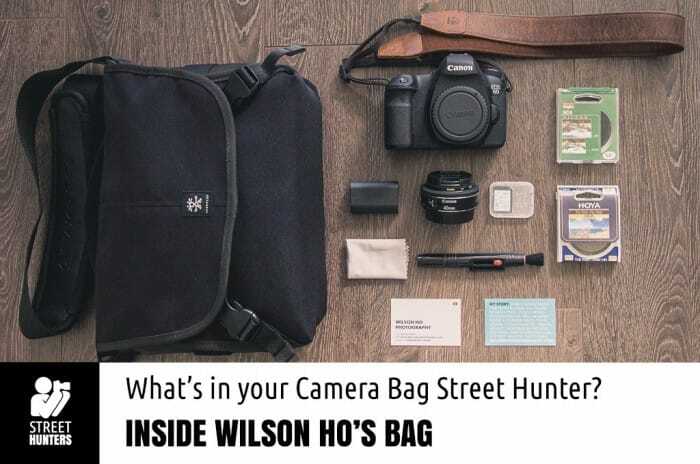 Send us your camera bags! I’m Dan James from Sussex, UK. I’m pretty new to street photography, and finding my style as I go. What I’m noticing attracts me most is not direct portraits and candids of people, but the traces and stories people have left on the streets themselves – weathered doors, discarded litter, abandoned buildings. The songs of the streets, written by those who’ve visited them. I’m also a big fan of simply capturing colours, shapes and perspectives that draw my attention and delight my eyes. After recently dabbling with digital again, via a Pentax DSLR and Sony NEX, both with vintage lenses, then a cheap Cybershot compact, I’ve realised it’s just not a media I can get excited about. So I’ve returned to shooting 100% with film cameras. The experience of using these beautiful vintage objects with their unique personalities, sounds, and scents, helps me immerse more deeply in the whole experience. 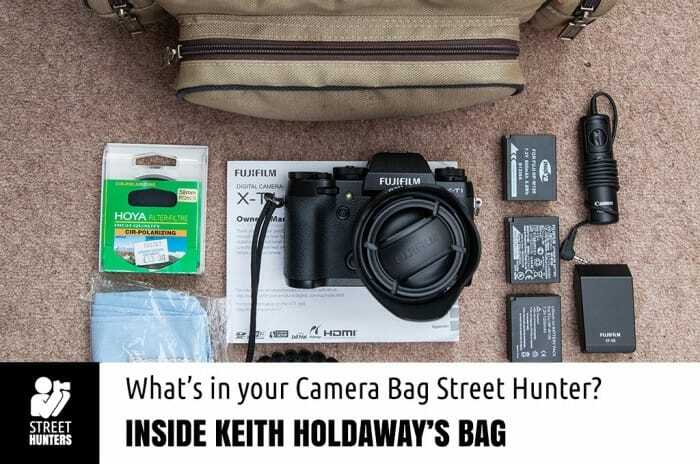 Inside Keith Holdaway’s Camera bag! My name is Keith Holdaway. Living in the city of Southampton, I enjoy the chance to photograph on the streets, but I am very new to this genre. The Fujifilm XT1 is my latest purchase and was bought specifically to travel light, as you can see from the contents of my bag I keep it simple. There are times I will leave the bag behind and carry the camera with a wrist strap attached, as I feel more invisible that way. I put spare batteries in a pocket and I am set to shoot all day. I really enjoy this little camera, its one or two faults are well out weighed by how it performs, I just can’t put it down! The street photography I am comfortable with is more the candid shot, I am not into pushing my camera into people’s faces. I find inspiration from images on the StreetHunters group. 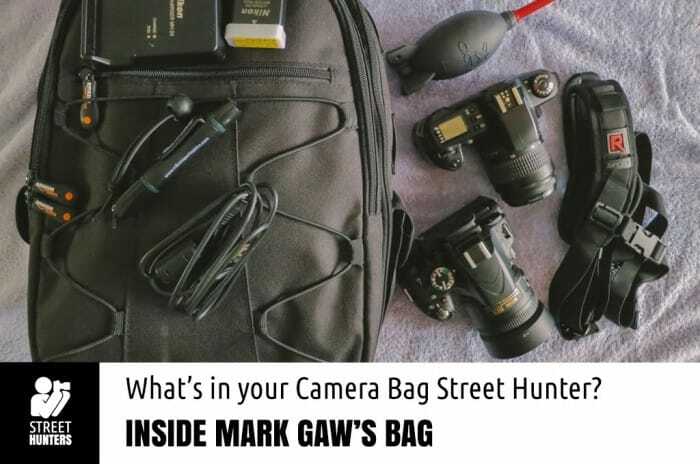 Inside Mark Gaw’s Camera bag! I believe photographs tell stories without using words. When people view my art, I hope their imagination will scribe their own story. Over the past year my passion for photography has grown quite a bit. After purchasing my first digital camera, I thought my targets would be landscape and macro. This is now not the case. I love urban photography and street photography. Things broken down, rusted and abandoned appeal to me as well. I consider myself to be a photo journalist. My personality is introvert. This is something I embrace and accept about myself; it’s not a weakness. Believe me. In the future I will be publishing photo books of my work. Photographers who inspire me include Thomas Hawk, Eric Kim, Jared Polin and Henri Cartier-Bresson. 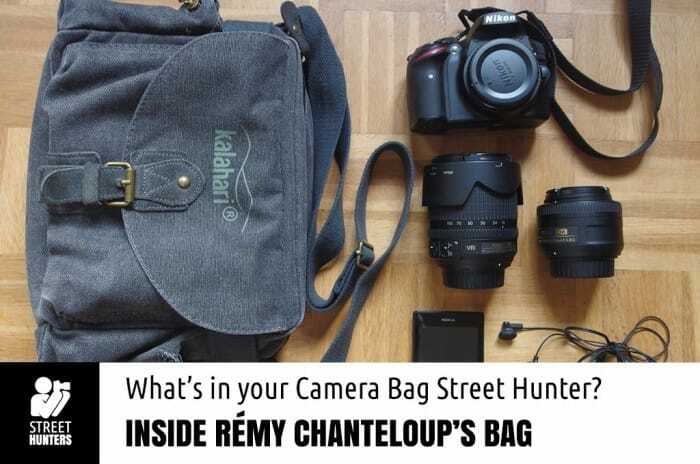 Inside Rémy Chanteloup’s Camera bag! My name is Rémy Chanteloup, I’m a 18 year-old street photographer from France ( this is a excuse for my english ! ). I have started street photography in February 2014, and since July 2014, I do only street portraits. My bag is always changing. At the beginning, I had a little Canon compact camera. After that, I wanted to shoot film like my favorite street photographers ( Charlie Kirk, Elliot Erwitt, Bruce Gilden … ), and I bought a Minolta Dynax with two lenses ( 28-80mm and 70-210mm ). I also bought a Canonet QL28 and some films ( Ektar 100, Kodak Tri-X 400 ). After four rolls of film, I realized this is not for me ( I’m too impulsive, and had a very low keeper rate ). So, in July, I entered in the world of the DSLRs with a Nikon D3200. I think I have found the perfect ( and very light ! ) kit for me and I’m very happy with it. Today, you can find in my bag. 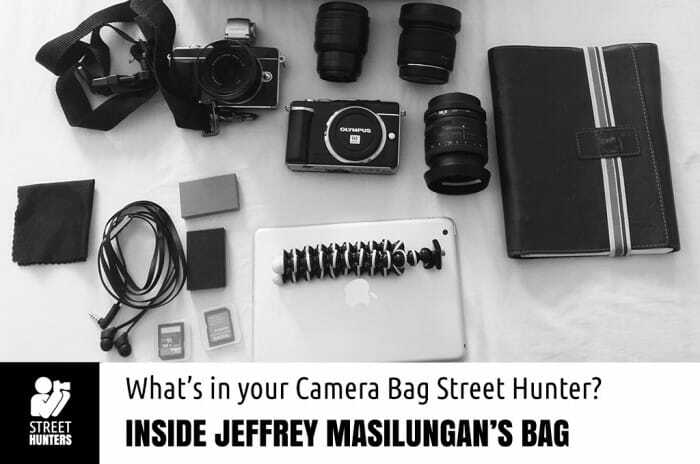 Inside Jeffrey Masilungan’s Camera bag! My name is Jeffrey Masilungan, I am a Filipino currently staying in Singapore. I do not carry everything everyday. I sometimes go out with just a camera, extra battery and memory card. I am very much interested in street photography and candid street portraits. I had been doing this as a hobby for quite sometime now but since I started I haven’t had a chance to shoot the street of the Philippines. I hope one day I will have the chance. I am a simple guy, I make use of what I have. I choose a micro four-thirds system (Olympus) because of the choices I have on lenses. I also want to try film in the future but for now I am satisfied with what I have and I love looking like a tourist. 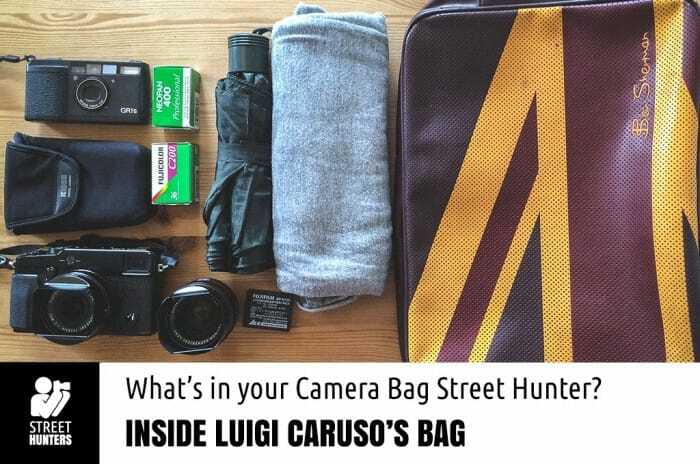 Inside Luigi Caruso’s Camera bag! Here’s Luigi, one of the many italians in London. I love old film cameras and I love to collect as many as I can. Despite my addiction to old full metal jacketed film cameras when I’m on the street I like to travel light and not attract too much attention, so I try to carry around as little gear as possible. I’m not big fan of camera bags so I just throw everything in an old bag (or an even older and much uglier backpack). I use my Ricoh GR1s in daylight or for indoor gigs (with the flash) while I use the Fuji X-Pro1 when there is too little light even for pushed films or I don’t have enough money to afford to shoot film. My favourite film emulsions are Fuji Neopan 400 and Fuji C200 (but I’m not fussy and like to try different stuff and experiment with everything I can find cheap on ebay or silverprint). 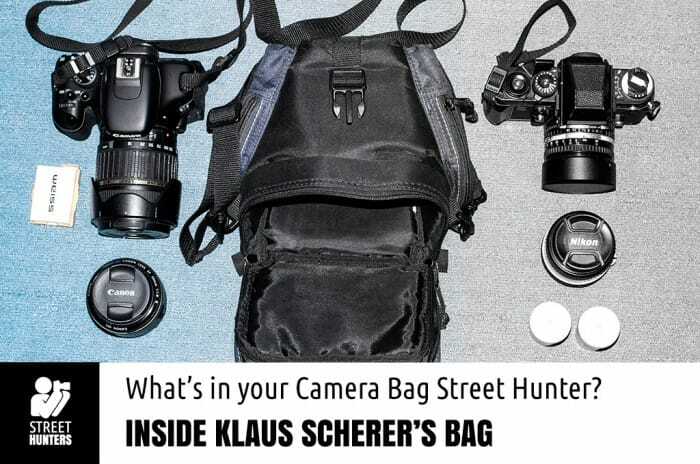 Inside Klaus Scherer’s Camera bag! I am Klaus Scherer, 60 years old. I live in Moers, Germany that is about 30 km north of Dusseldorf. When I started to take pictures again after a long abstinence, I dragged with me a bag with several lenses and various accessories. At some point I felt that it was too much and I reduced my load to a small bag for a camera. Since I photograph street, I often take only the camera on the road with me and leave my camera bag in the car. 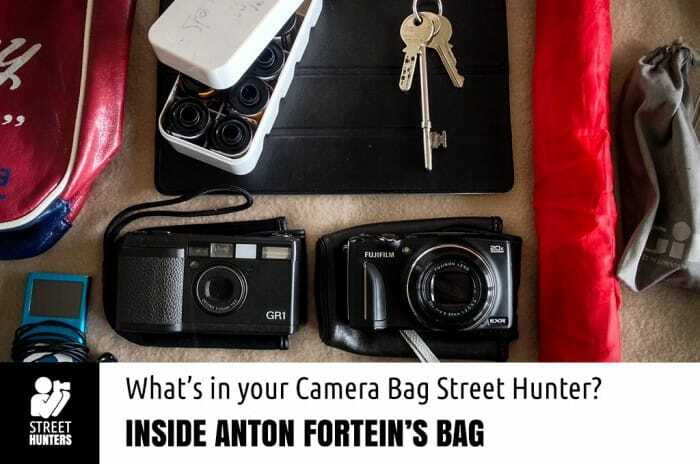 Inside Anton Fortein’s Camera bag! Just a quick look inside my bag. I’m afraid this is not a very complicated bag. Just the essential for what I need for a walk-about. Missing from my bag is some bottled water. I will sometimes swap out the RicohGR1 with my Leica iiia, or my Contax167MT. But as most of you know by now, I almost totally use film. This is what I enjoy, and will never push anyone to use anything that seems fashionable, but what makes then feel good, and enjoy shoooting. And as you also know, I shoot mainly on the street, and my bag reflects this. I like crowds and getting up close and involved. I want my images to show involvement with a life lived and experienced on the street. 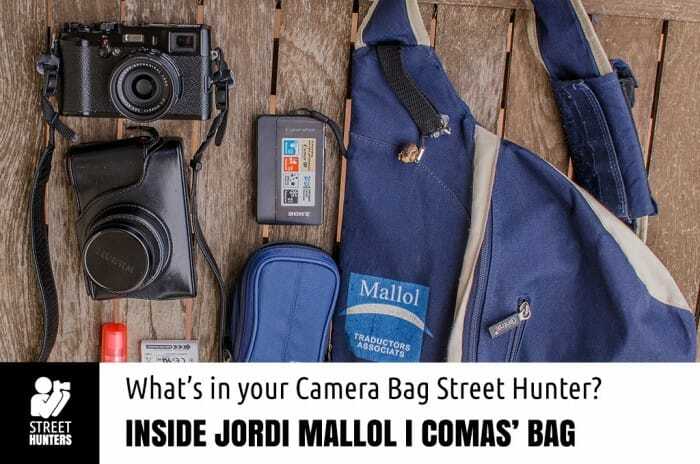 Inside Jordi Mallol i Comas’ Camera bag! I’m Jordi Mallol i Comas, from Barcelona, Catalonia, Spain. Married, two youngsters. I run my own company (translation services). I like cooking, making bread from time to time, making mermelades with fruits of the season. I love rock and blues music, I’m a fan of Southern rock, Delta blues, California rock. My favourite group is Lynyrd Skynyrd, but big fan of Neil Young, Jimmy Hendrix, Eric Sardinas, Dikinson brothers, Lou Reed, Eric Clapton, Allman Brothers, John Mayall, and an endless etc…. I like Japanese literature (translated into Catalan or Spanish, of course), but I also love southern literature, of Faulkner, McCullers, etc. I’m also interested on the WWII, the Holocaust, post-war period. I’m a TV series maniac and I love cinema. I exercise one hour of elliptical trainer (machine) every day and run 8-10 km once a week. Enjoy skiing in winter and fishing in summer. I love to walk, either in the city or up at the mountains.